Q: I came by to check out the gym and the doors were locked. What gives? Do I need to schedule an appointment? A: Our doors are ALWAYS locked. 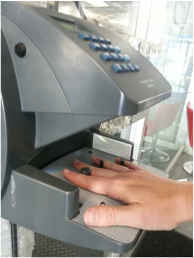 theGYMkc is accessible 24 hours a day by use of a biometric hand scan recognition door access system. When members sign up, they are assigned a member ID, their right hand is scanned, and the image is stored in our database. If you would like a tour the facilities, please call us at 816.960.0502 to set up an appointment. If you arrive and do not get the attention of the front desk person, please don't follow a member into the gym. The member has been instructed to karate chop first and ask questions later. Instead of Kung Fu fighting your way in, just call 816.960.0502, and we'll get the front desk person up to the door. * Note: If you wave to a member and he/she doesn't let you in, please don't assume that he/she is rude. We have a strict policy against letting non-members into the gym, i.e. we will cancel his/her membership.